Richard Štefl wants to penetrate the mysteries of genomic dark matter which constitutes the so far missing link in understanding cell mechanisms and human diseases. 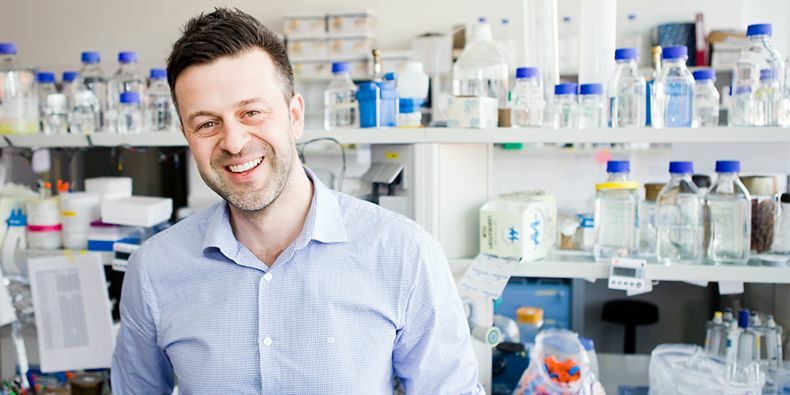 Richard Štefl is only the second scientist at Masaryk University to receive the prestigious ERC grant. The European Research Council only gives it to projects that have a chance to push human knowledge forward in a fundamental way. Štefl, who leads a research group at Ceitec, wants to penetrate the mysteries of genomic dark matter which constitutes the so far missing link in understanding cell mechanisms and human diseases. In the context of other terminology of your field, the term genomic dark matter sounds suspiciously attractive. What is it actually? It is a high-sounding term for non-coding RNA (ribonucleid acids). It seems that they are the key to understanding many mechanisms inside of cells which form a basis for the functioning of the human body as a whole. At the same time, they are also the key to understanding a wide range of grave illnesses. Is the term somehow connected to the dark matter in the Universe? There is a direct analogy. Genomic dark matter had also not been seen for a long time; we always observed it only indirectly through its influence on well characterized cell components. It is the majority that apparently controls everything. We are now trying to map how it is created and why and what exactly its functions are. What has changed that such fundamental facts have been discovered specifically now? In the past, not much was known about dark matter, since it has a short lifespan. It was only discovered inside the cells with the help of new technologies. We also have more knowledge and new procedures for studying non-coding RNA. With my lay knowledge from high-school, I remember RNA being only a not-so-important part of the whole procedure of processing genetic information. Originally it was believed that RNA is only a primitive molecule that merely carries genetic information. Then it turned out that RNA can also have a catalytic function. Now we know that the most important enzyme in the body is the so-called RNA enzyme which synthesizes proteins. And it is also turning out that RNA has a regulatory function as well. It works from above and controls everything from the background. This sounds like a discovery which could cause a revolution. How did you manage to seize this topic for yourself? Of course, we are not the only ones focusing on this. But we suggested an innovative original approach to the structural mapping of dark matter formation. Kurt Wüthrich, a Nobel laureate who helped with the developing of Nuclear Magnetic Resonance (NMR) methods, came to give a lecture here in the middle of March. I was drawing a scheme on the board to show him how we want to achieve this and Kurt said that if he were my age, he would want to work on it, too. I was very pleased to hear that. What do you think is ahead of you? Besides the knowledge itself, there is a clear overlap into diagnostics and the treatment of some illnesses. When we find out how non-coding RNA is created and in which mechanisms it is implicated, we can also understand how some diseases originate, which then enables us to make specific interventions. Do you mean the specific targeted treatment of cancer which is researched by groups at the molecular medicine program of Ceitec? Exactly. In the structural biology program, we are striving to describe mechanisms that they try to influence. If we have a better understanding of the processes, it is easier for them to target the treatment. Simply put, we can open another door for them. People might assume this in every era, but aren't we now reaching the very borders of knowledge? Do you think that there is also something else behind non-coding RNA? I think that when it comes to understanding the regulation of genetic expression, we are reaching the very bottom. Of course it is possible that there is something else behind it, but there is no indication of it that we now know of. Doesn't it give you the shivers? It is exciting, however, discoveries are not made every day or week or even month. They require a huge amount of routine work in the labs as well as administrative work. Have you experienced a moment during your career when you really felt that you made a principal discovery? There was one extremely exciting discovery which we made years ago, when I was partially working in Brno, but still with one foot in Zürich. The topic was how a nucleotide sequence is primarily stored in the duplex RNA and how proteins read it. Until then we had only had that kind of knowledge about DNA, which had been previously receiving more attention. The RNA mechanisms were not known. And it was us who partially uncovered them. That was a big thing then. Did you fulfill some of your student goals and ambitions? I wasn't thinking that far into the future back then. That I am doing specifically this work and that I have discovered some things is a result of many variables. Actually, it was a pure coincidence. How did your specialization develop? I originally studied computational chemistry. If you want to specialize in complicated processes, knowledge of one field is not enough. I moved from the area of chemistry into biology and till this day I see this as a huge advantage. It gave me a wider perspective. On the level of your work, the boundaries between chemistry and biology are probably rather thin. That's right. We study the chemical communication of molecules, but from the perspective of biology. The driving force for me has always been my desire to know what is the structural basis behind a certain biological phenomenon. Solely with the help of computational chemistry, it was not possible to describe it. I needed more knowledge of physics and biology. What would you recommend to a university student who sets their heart on a scientific career? What should they do in relation to their studies? Travel, travel, travel. It is essential to try more than one institution. After graduating, it is important to change labs, to go somewhere else for the doctoral studies and somewhere else for the post-doctoral studies. This way you can broaden your horizons, gain experience and find out what is the right thing to do and where is the right place to do it. Very. The way things work in science today, it is necessary. I assume without this quality you would not be able to apply for such a prestigious grant as the ERC grant. I was considering whether or not to give it a try for a long time. At the beginning, you always have to think your chances over. And because the competition is so prestigious, I was rather sceptical. But then my team came up with this revolutionary idea. So we decided to apply and it ended well. So having a great idea is the key? It is a combination of several elements. Achieved results, the quality of the scientific center – which means that our success is also a great quality mark for Ceitec as well – and a revolutionary idea which the European Research Council would consider as one possibly bringing a fundamental step forward in human knowledge. What role does a scientist of your standing actually play on the team? Are you more of a manager who tries to find capable people for the team? I hope that the ERC grant will help me return to the lab. At the moment I am de facto only an administrator and manager of a portfolio of smaller grants. Of course I talk with the team members about their work, but in reality I do not have a chance to work in the lab. I hope I will not need to spend so much time trying to secure smaller grants in order to keep the lab going. The ERC grant is rather flexible, it gives us a lot of freedom for the next five years. Of course these two million Euros will not be enough for the operation of the whole lab and we will also apply for other grants, but it will constitute a substantial part of our budget and we will be able to invest less energy into administrative work. Who were your rival candidates? I didn't know that until the last moment, but of course then I met them on the day of the interview in Brussels. They were people such as a group leader who has been working in European Molecular Biology Laboratory (EMBL) for eight years or a group leader from the ETH Zürich. That means people from the top-ranking European institutions. In my panel of molecular and structural biology and biochemistry, thirteen applicants succeeded which is about ten percent of those pre-selected during the first round of the selection process. Only a fraction of original applicants are invited for the interview. Can you describe the whole process of preparation? We came up with a rather complex project and if we presented it only as an idea detached from reality, there would be a very low chance of success. Hence we have been generating preliminary data during the past two years to show that our concept will work. We had to provide evidence that this is not a project on a green field. So it involved two years of generating data and testing hypotheses. In the second round you had to pass an interview in Brussels. What were the preparations for this part like? I spent about one month getting ready. Mainly it was about reading the literature so that the committee does not catch me unprepared. You have to be very well informed about the current state of knowledge. And you should also know all the weaknesses of the project so that you are able to justify them. It is important to have a plan B for the whole project. How do you feel about this success? For a long time, we could not believe it. It feels really good. In Ceitec, together with Pavel Plevka there are already two of you who have received this type of grant. Do you think you have set a trend? Will others follow? That would be great, but we should keep both feet on the ground. If others follow, there certainly won't be dozens of them. One of the students whose thesis I supervised was recently at a couple of interviews applying for doctoral studies at EMBL and ETH and because he is still quite young and is not so well informed about the situation in science, he was telling them how he comes from this amazing place, Ceitec, where we have two ERC grants. And they just smiled and said that there are eight of them on their floor and they have five of those grants among them. So he told them how we have amazing instrument equipment and what kind of microscope we have. And they say, yes, we have two of them. Ceitec is a very good institution compared to the European average, but we have to try harder if we want to get among the very best. There are many things. Ceitec is mainly suffering because of the warped system of evaluating and financing science in the Czech Republic. In this system it is very hard to successfully defend a longer groundbreaking project like ERC. The system forces us to publish preliminary data, there is no time to finish the larger story and publish it in a top journal. It is also not possible to create enough attractive medium-term positions for newly arriving elite scientists. And that is not a good thing. Not that long ago, scientists were often saying that their motivation to come back from top-notch institutions abroad is the return home itself and that they need to make compromises. But you do not hear this so much lately any more. How was it with you eight years ago? It has changed a lot. I was returning already with the prospect of working for Ceitec. At the time, it only existed on paper and the whole process lasted longer than expected, but eventually it ended up well and it is definitely a great promise for the future of Czech science. I don't deny that my Czech roots were my key motivation. I wanted to come back despite other attractive offers from abroad. Would it be easier or harder to open your own lab today? The starting conditions are better now. When I came back, I had to carry a lot on my shoulders. I had to secure all the money for equipping the lab by myself, but I managed to get some startup grants from abroad. The environment at the university and the facilities for scientists have changed a lot as well. In that sense, it has become much more cultured.